It was raining, and Jasmine Yedra carried the contents of her life in two black trash bags. She was a sophomore in high school, and she was homeless. It didn't matter that she was a strong student at one of the state's top high schools or that she was a gifted musician – piano, guitar, ukulele. Family and financial complications meant she was standing on the corner of Roosevelt Boulevard and Cottman Avenue in Philadelphia with no idea what came next. Her palms began to sweat. She began to cry. Then, Yedra did what she has done for so many years: She pulled herself together and figured it out. "Jasmine never, ever gives up, even though she's had any number of curveballs thrown at her that most people would find debilitating," said Tim Atwood, a staffer at Philadelphia Futures, a program for promising college-bound students in the city. "They're setbacks for her, but she always comes back." That makes her emblematic of so many city students, who triumph despite – or even because of – daunting odds. Still, her path has included more obstacles than most: health challenges for her and her family, challenges at home, time spent in the foster care system, and doses of anxiety and depression far beyond the typical high school worries. Yedra is 18 now, a senior at Central High School with a 3.8 grade-point average, a roster full of advanced classes, an eye on college, and a poise and wisdom that belies her age. "I care about the things that matter, and I don't care about the things that don't, honestly," said Yedra. "What matters is how you treat people." Yedra was born and raised in South Philadelphia, daughter of a mother from Nepal and a father from the Philippines. She is the second oldest of six sisters; her parents split up when she was 5. Her father was strict – "a lot of rules, no playing until you finished your homework." The girls were smart and Yedra, the introspective one, took those rules to heart. "I didn't have that many friends, but I read books," she said. She attended Andrew Jackson Elementary School, where she thrived academically and musically, thanks to the rock band started by music teacher Chrisostomos Argerakis. Yedra, in fact, named the band "Home" after an Edward Sharpe and the Magnetic Zeros song the group learned, and for what it meant to her. Jasmine Yedra (top row on the right, arms folded) was a member of Home, the Andrew Jackson Elementary School rock band. Chrisostomos Argerakis (center), the music teacher who founded the band, remains a trusted mentor who marvels at Yedra’s strength. The band is pictured in 2014, when Yedra was in eighth grade. Argerakis, who remains a mentor and friend, has known Yedra since she was 7; even then, "she was mature beyond her years. She had this aura of being positive and looking toward the future." Things at home were never perfect, but they took a sharp turn for the worse when her mother was diagnosed with cancer when Yedra was in eighth grade. There were also complications due to alcoholism in the family; Yedra would stand up for herself and her sisters, then be kicked out of the house. Yedra dealt with anxiety and depression and moved from house to house, couch surfing with friends and relatives. By the time she was a sophomore at Central, she had lived in and left four separate homes, those black trash bags the one constant. In 2015, a massive earthquake struck Nepal; several aunts, uncles and cousins were missing for weeks. They were eventually found safe, but had lost everything; Yedra's family cobbled together money to send them to help repair houses. Everything felt surreal some days, especially when her classmates would fret about one teenage issue or other. "I had bigger problems: Where am I going to sleep, what am I going to eat, where am I going to do my homework?" she said. School, always a priority, became even more important. "Between 8:30 and 3:00, I knew I would be OK. I got a free lunch and I had people to talk to." Life became untenable when she was a junior, and Yedra and her sisters entered the foster care system. For a time, she lived with a family in Montgomery County, one of the most isolating times in her life, she said. Eventually, Yedra met Sarah Wasch and Greg Weyer, a social worker and a lawyer, who became her foster parents. From their first meeting, Yedra felt at home with them. "They were just different," Yedra said. "They wanted me to feel comfortable." On Sept. 5, Yedra moved her black trash bags for the last time, into Wasch and Weyer's house in South Philadelphia. It was also the first day of her senior year. Yedra is comfortable at Wasch and Weyer's place in a way she hasn't been in a long time, she said. Her senior portraits are prominently displayed, and the family decorated the railing leading to the second floor with stockings because that's a tradition Yedra cherished from childhood. "I like it here," Yedra said. "For a long time, I didn't have some of my basic needs. Here, I have anything I want or need, and they're sweet and loving." For her part, Wasch is wowed by Yedra: "We love, love, love her," said Wasch. "She is kindhearted and career driven, and one of the most motivated students I have ever met." Yedra still copes with her own health challenges, including appendicitis and lingering complications that required a recent hospital stay. But mostly, she's a normal kid – she and her boyfriend are on a mission to see all the Marvel movies, and she loves TED talks, and playing ukulele. She spends time at Jackson, mentoring the band members, when she can, and has volunteered at charity drives at Central. 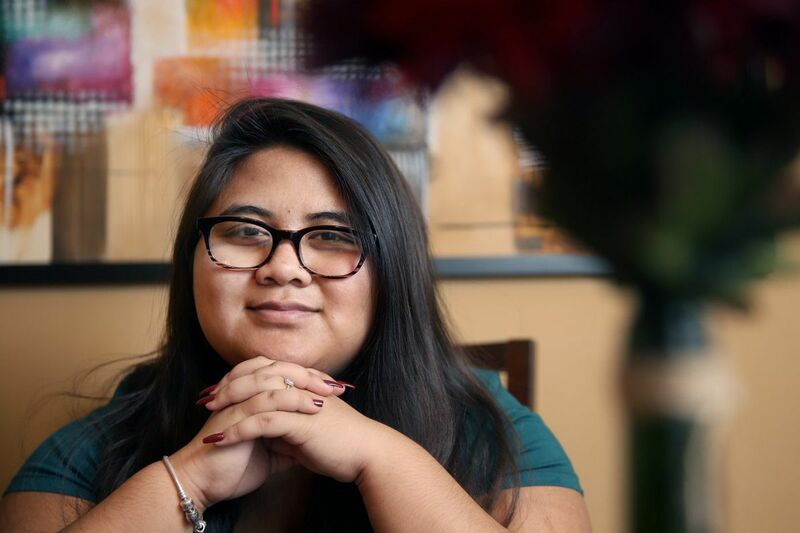 Philadelphia Futures, the nonprofit college prep program that provides intensive preparation to get first-generation students to and through college, has been an enormous help since she joined as a freshman, Yedra said. And Atwood, the Futures staffer who works closest with Yedra, marvels at her grit. Even at her lowest, she was still in touch, Atwood said, strategizing about how to get past whatever she was dealing with. Many other students have parents to get on them about taking the SATs or making college application deadlines; everything Yedra accomplished, she did on her own. "And she has this sweet thoughtfulness about her, as well," said Atwood. "I don't think I've ever had a conversation with her that's ever been one-sided. She is always concerned about what is going on with other people." With all Yedra has endured, Argerakis, the music teacher, would understand if Yedra dwelled on the hand she's been dealt. "But she doesn't use it as a crutch, and she never has," said Argerakis. These days, she's in a better place with her family. Her father works a lot, but calls her often, and she meets with her mother and sisters weekly. And she remains firmly fixed on what comes next – she's on pins and needles waiting to hear from a long list of colleges, including her top choice, Temple University. Lehigh, West Chester and Penn State are also considerations. Yedra plans to major in psychology and minor in business, with a possible career as a psychiatrist. She's letting herself dream a little, too; she's never been out of the tri-state area, and wants to travel. "I want to drive for more," Yedra said. "I want the things my parents couldn't provide. I don't care how much money I make, but my biggest dream is to create a home for myself."